Today we will look at the difference between types of Pilates studios as an example of the differences you will find in nearly every form of fitness studio. Much like franchises in every industry, Pilates franchises are designed for uniformity in both look and in function. Generally they focus on larger group reformer classes (10+ people), where all the participants perform the same exercises, usually in time with one another. They usually have one type of machine and the machines are often lined up in a single row in a long narrow room. Often, there is one instructor demonstrating/cueing/correcting the exercises from the front of the room. The limitations of this type of group class is that the exercises are generic and the instructor has a limited ability to correct individuals (the more participants, the harder this is). Beginners to Pilates, individuals with any pre-existing conditions, older adults, pregnant women, and many others may have challenges keeping up with the group without additional hands-on help. This can make a workout less productive, and even possibly lead to injury. Additionally, most franchises do not offer Private or Semi-Private Sessions, as their studios are designed for large group classes only. This large group mentality is reflected in their pricing structures, which focus on monthly packages with recurring payments and special "deals" for longer commitments. Independent studios tend to focus more on the individual rather than on sheer numbers. Generally, group classes are 3-5 people (that size of class is often referred to as a "semi-private" session in many other types of fitness training). 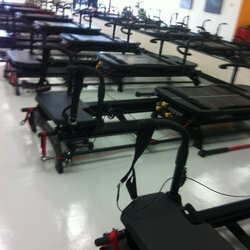 Independent studios usually have a vast array of Pilates equipment, not just reformers. This allows for a greater variance in training. With that variance comes faster and more beneficial results as muscle confusion is greater. Unlike large classes at a franchise, were everyone does the same exercise, independent studio trainers design exercises that are tailored to each individual participant. Everyone works at their own pace and ability under the close supervision of the instructor. There is no pressure to keep up with the group, there is no pressure to perform exercises beyond ones capability. Independent studios also offer Private sessions, which offer the highest level of one-on-one attention. Yes, you will pay slightly more at an independent, but it is well worth the attention and results you will see!